--- THINKING modifies behavior. Behavior modifies activities. Modified activities modify results. Mankind: The most incredible species on earth. as individuals, to create the kind of life we are more than capable of creating for ourselves. MAN is not the strongest animal on earth, nor the fastest. What makes mankind so special is his mind. His ability to THINK, ADAPT and SURVIVE in ever-changing conditions and in so many different environments. Beyond your mind, every other body part you have can be found in a cow, pig or a chicken. SURVIVAL: Every morning, in Africa, the lion wakes up knowing if he is not faster than the gazelle, he will starve and die. Every morning, in Africa, the gazelle wakes up knowing if he is not faster than the lion, he will be killed and eaten. It doesn't matter if you're the lion or the gazelle, when the sun comes up in the morning, you'd better be ready to run. MANKIND's ability to survive and thrive in the modern world is based more on his ability to THINK than anything else. Your ability to "train-or-retrain-your-brain" to THINK and TAKE ACTION that contributes to your fellow man's benefit determines whether you are "a have, or a have-not." The more you give of your talents, skills and abilities to serve others, the more you receive from others. "The receiving process" begins... when you begin "the giving process." "The Miracle of Your Mind"
One of greatest ideas I've ever heard came from Andrew Carnegie. He said, "You were born with the power to take control of your own mind and direct it to any end result you desire." Think about that! Only you get to choose what you think about today. Only you get to pick your attitude today. The success cycle-of-activity begins with an idea. This site has many ideas and the sources are from the greatest thinkers and achievers who ever lived. Go ahead, dig for the gold, it's here. As Napoleon Hill said, "More gold has been mined from men's minds than will ever be mined from the earth." (1) Idea / Ideas (defined) - The mental perception of an image that has meaning to the conscious mind. (2) Think / Thinking (defined) - The logical processing of thought. The processing of thoughts is, the processing of ideas. Your lifelong"Idea-Decision-Action-End Result" pattern of activity determines if you will ever be.. Healthy, wealthy, wise and happy or always sickly, poor, ignorant and unhappy. Every self-improvement idea you will learn about from this website, regardless of the source, is designed to encourage you to THINK DIFFERENTLY about yourself, your mind, your body, your use of time, your money skills, your relationship skills, and your "future end-result" possibilities. 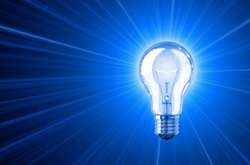 Better ideas lead to better decisions, better actions and better end-results. Since you're not going to live long enough to figure it all out on your own, Learn From The Giants has put together a group of world-class "Master Teachers" to help speed up your success education. 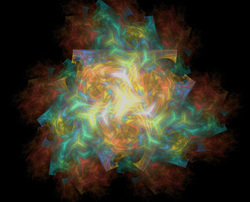 Infinite Intelligence, God, Mother Nature, He, She, It, "The Force"
When the "Infinite Intelligence" a/k/a God, Mother Nature or by whatever name you call Him, Her or It, created the complexity of the wonderment we are all a part of, the Infinite Intelligence must have had a reason to make each of us totally unique. I am grateful for the diversity otherwise, we'd all be the same in our appearance, thoughts and actions. As my son would say that would create a serious case of "Bore-Max." Because we're all blessed with individuality, no two people have the same set of needs, beliefs or understanding of information. We have published many ideas and sources of information without censoring what is available. You have to expose yourself to what is here and determine for yourself where the value is. The only criteria we used in gathering the information was, "Is there a possibility that this specific piece of information might help someone build a better life?" If there was even a POSSIBILITY, it got published. Most of what is published here or linked from here has been an important part of my life since I was a teenager and I can assure you, "the shortcuts to a better life" can be found on these pages. There aren't but two reasons..
you don't (yet) have everything you want in life! Either there's something you don't yet know or there's something you're not yet doing. Let's see if we can figure out which. "The richest man in the history of the world" left you a 'thirteen step plan' that reads like a cake recipe. Read it, understand it, follow it, do it, and you too can have literally anything you want in life. The starting point is to know how this '13 step plan' came together. In 1908, Andrew Carnegie, received a letter from a recent college graduate requesting a three hour interview. The letter came from Napoleon Hill, a young man who lived back in the mountains of southwestern Virginia. Hill had earned his high school and college money interviewing successful people for local newspapers. Hill wanted to make a career out of writing. If he could interview Carnegie, the richest man in the history of the world, surely he could sell that interview to a publisher. Carnegie agreed to the interview. On the day of the interview, as the three hour mark was near, Carnegie said, "Mr Hill, I have so much more I want to talk to you about. It might take up to three days to cover everything I want us to discuss. Will you be my guest, at my house, for the next three days?" Hill was glad to be invited to Carnegie's house because the only money he had was train fare to get back home. Over the next three days, Carnegie confessed that he didn't understand why everybody wasn't rich. He said everyone in his circle of acquaintances was earning millions of dollars every year and any of them could hire an unlimited supply of highly skilled workers who were happy, just to have a job that paid $5.00 per day. [A very good salary in 1908.] He thought that his circle either knew something the average person didn't yet know or they were doing something the average person wasn't yet doing. 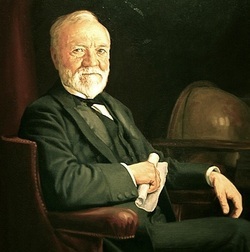 Carnegie offered Hill a letter of introduction to the biggest Icons of Success, the Captains of Industry and the Big-Time, Heavy-Duty, Over Achievers to gather interviews to determine what the unknown common denominator was that might explain their abnormal successes. Carnegie offered no salary but, asked Hill for a twenty year commitment to the project after which Hill could do anything he wanted to do with his research. It took Hill 29 seconds to agree to commit to following through with the assignment. 500 interviews and 20 years later, Hill wrote a report of his findings which became a classic best selling self-help book on how to get rich, or to achieve anything else in life you might desire. Nearly 100 years later, every major book store in America still has copies of Hill's report. "Fast Forward" 52 years later to 1960, I bought a copy of Hill's final report. The fifty-cents decision... that changed my life. 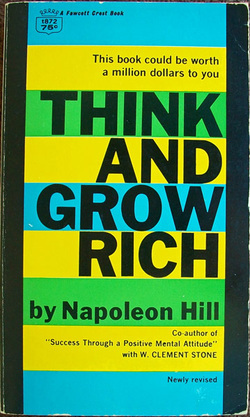 When I was 15 years old, I bought a book called, "Think and Grow Rich" by Napoleon Hill. The book, in 1960 cost only fifty-cents but, it most definitely changed my life forever. Let me tell you what I learned from that fifty-cent investment. Carnegie thought there was only one common denominator that separated "the haves from the have-nots". As it turned out, there were actually thirteen. (A) So, there are thirteen common denominators that are shared by all super-successful people. Chapters two through fourteen of Hill's final report identifies each of the thirteen steps, and analyzes each of them in great detail. (B) The thirteen common denominators read like a road map, a recipe, a blueprint, a formula that leads to successful end results. Anyone, including you, can read the thirteen steps, understand the steps, apply the steps and have whatever you want to have; be whatever you want to be or become; do whatever you want to do, go where ever you want to go, and/or learn more about anything you choose to learn more about.. Nothing I had ever been exposed to had given me more hope and confidence about being able to direct my own life to any end result that I desired. Because of this new found hope and confidence, I began a lifelong search for other, similar "road maps, recipes, blueprints, formulas" that might build on what I had discovered in Hill's final report, the book called, "Think and Grow Rich." I've now been studying print, audio and video media on the subject of success for the past 50 years. I'm not an "expert." I am certainly not an "authority" on the subject. Think of me simply as an "investigative reporter" and everything you find here is a consolidated report of the best I have found so far. When and where appropriate, I will redirect you to the people, articles, websites, print, audio and video materials that I consider to be among the best of everything out there. with anyone at anytime for any reason. We hate spam even more than you do! us and we will cheerfully comply with your request. (C) Any correspondence to "Learn from the Giants"
benefit of all our subscribers. All other content owned by the respective copyright holders.